If you don’t want to opt for the Taylor Little Sheller, but the Mr. Pea Sheller and its electric cousin don’t quite cut it, the Mini Pea Sheller is the sheller for you. At roughly two-thirds the size of the Taylor Little Sheller, it doesn’t operate with the same speed as its older brother, but comes at a more affordable price. After spending some time testing an early model, I’m ready to offer my first impressions. 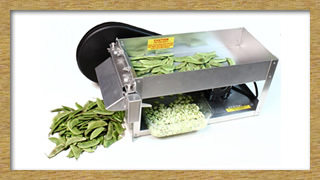 The Mini Pea Sheller is a high-quality piece of equipment: it has a rust-proof aluminum frame, adjustable rollers and a powerful one-tenth HP motor. The motor is the most expensive part of the Mini Pea Sheller; if it dies, you’ll probably just want to purchase a new sheller altogether rather than replace the motor. To make sure their shellers maintain a long lifespan, Taylor uses high-quality motors made right here in America. In a machine this size, a one-tenth horsepower motor is more than powerful enough to handle even the heaviest loads of butter beans or crowder peas without getting overwhelmed. Naturally, this sort of work can generate a lot of heat, especially when worked in hot and humid outdoor conditions. An internal fan works tirelessly to keep the motor nice and cool, and even after 16 hours of testing under a simulated moderate load, it showed no signs of having trouble. Though I was unable to overwhelm the motor in my tests, the Mini Pea Sheller does include an automatic thermal protection sensor. If the motor starts getting too hot, it will immediately shut itself off to cool down. It will automatically resume shelling once it’s cooled down a little, so be sure to unplug it or turn it off if you want to give it a longer rest. After 16 hours of nonstop testing, I’m convinced that you’d be hard pressed to get this sheller to overheat. In the unlikely event of an electrical problem, the Mini Pea Sheller’s plug includes a third prong to protect the both equipment and the user. The third prong acts as an electrical ground and prevents fires and electrical shock when dealing with more heavy-duty machines.